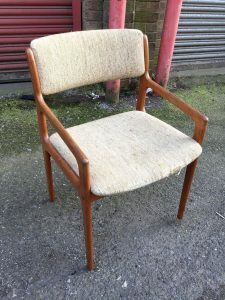 A vintage 1960’s Danish teak curved back hall chair, upholstered to the seat and backrest in cream canvas. 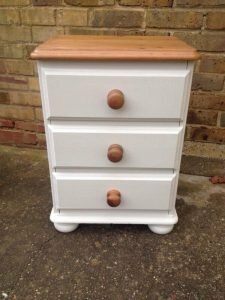 A hand painted white solid pine chest of drawers on ball feet, having three drawers. 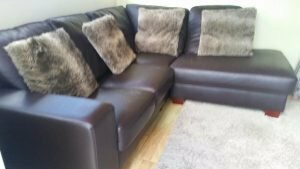 A four seater high back right hand corner sofa on solid wood feet, upholstered in chocolate brown faux leather, together with four faux fur square cushions. 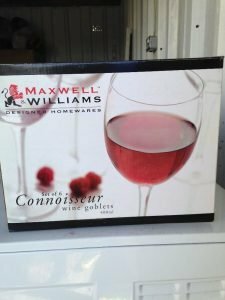 A brand new boxed set of 6 Maxwell Williams connoisseur wine goblets. 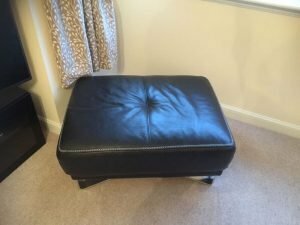 A small rectangular footstool on chrome legs, upholstered in black faux leather. 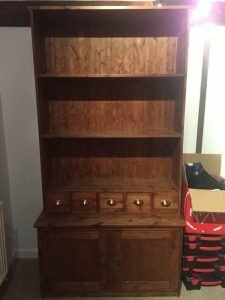 A tall standing solid wood Welsh kitchen dresser, having two shelves above five spice drawers and a double cupboard. 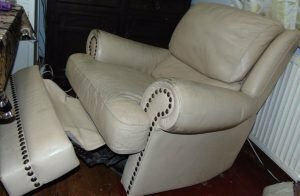 A high back vintage reclining armchair, upholstered in cream authentic leather with studded details. 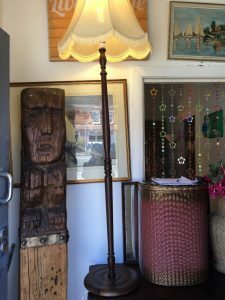 A tall vintage solid mahogany floor lamp and cream tasselled shade. 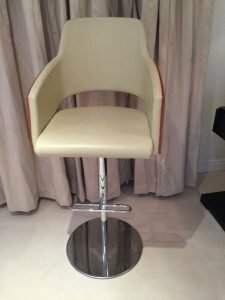 A tall high back retro chrome and pine breakfast bar stool, upholstered in cream leather. 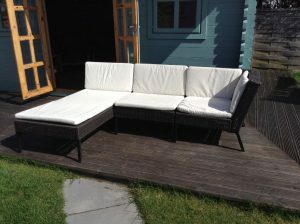 A four seater high back left hand rattan corner garden sofa, upholstered in white fabric. 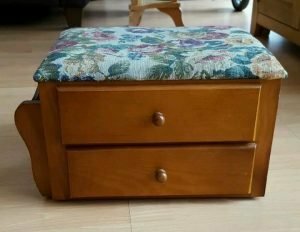 A small solid wood rectangular two drawer footstool, upholstered to the seat in floral patterned fabric. 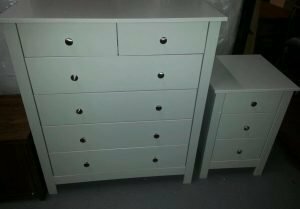 A tall solid wood white chest of drawers and matching bedside chest of drawers. 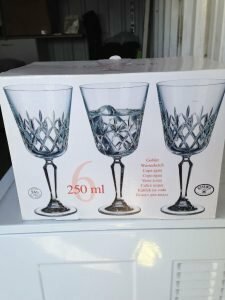 A brand new boxed set of six tall crystal wine goblets. 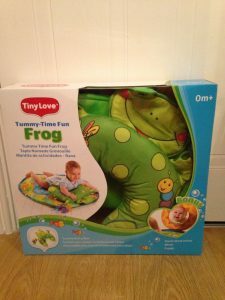 A brand new boxed TinyLove Tummy-Time fun frog play mat. 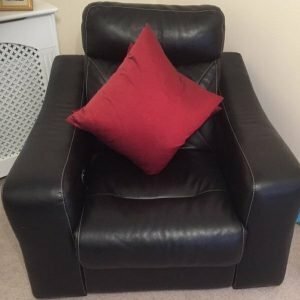 An Italian high back armchair upholstered in black authentic leather, together with a square red sofa cushion. 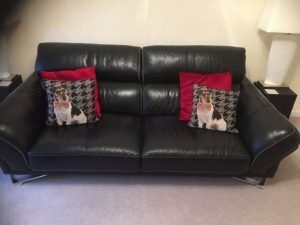 An Italian two seater high back sofa on chrome legs, upholstered in black authentic leather. 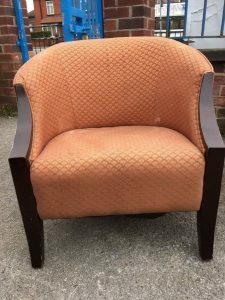 A vintage curved back solid mahogany tub chair, upholstered in orange patterned fabric. 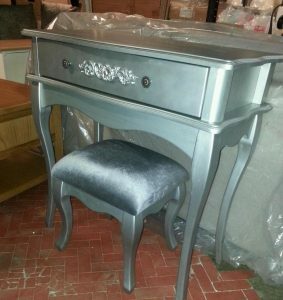 A hand painted silver solid wood one drawer dresser unit, together with a matching stool, upholstered to the seat in silver velour. 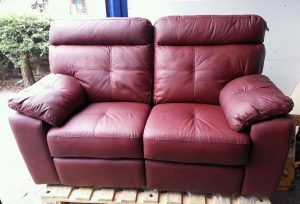 A two seater high back reclining sofa, upholstered in deep red authentic leather. 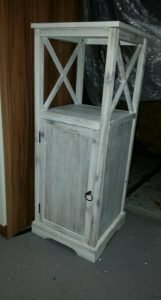 A tall solid wood hand painted white side unit, having a shelving space above a cupboard.